One of the more frustrating, and least discussed, aspects of 2002 is that Wofford had a much better resume than Appalachian - ASU should have been the team on the bubble. Appy's best wins that year were a win over Furman in the "Miracle on the Mountain" go-for-2 game and an equally miraculous win over Liberty where Liberty dominated for 55 minutes and then collapsed. Although much was made of their AD being on the committee, I have always felt the committee, in classic gold ol' boy fashion, chose to go with the three established teams. The valuable lesson learned in 2002 was take control of our own destiny and don’t leave it open for politics and the subjective to take it it away from you. Grab it by the throat and leave nothing to chance. Hope this team knows that tomorrow. 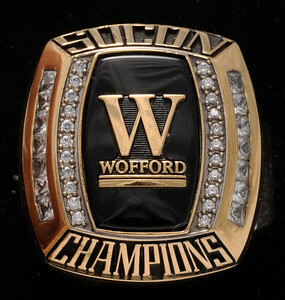 I was told-don't necessarily know it to be true-that App felt like Wofford was not good for the Socon. "Brought nothing to the table" is the quote I remember. They are several AD's down the line now, and I think the relationship with Wofford is OK; but that was a direct slap to us. I realize all the platitudes about us controlling our own destiny, but there are those who think it was a very deliberate move. Congrats Shorthaired Dawgs 2017 SoCon Champions! We did our part so lets go up to SCAR and give them hell. I still am speculating a 6th seed (5th would be long shot). WCU may have just booted itself out of the playoff, currently losing to Mercer. I still stick by FU is the hottest team in FCS right now. The Samford vs Furman game could decide if we get 2 or 3 teams in. A Samford loss and they are on the outside looking in (UTC and WCU loss). A Furman loss and they could still factor in the playoffs. Last edited by WocoSix on Sat Nov 11, 2017 7:46 pm, edited 1 time in total. Still some games in doubt, but we are in pretty good shape. Elon was going to lose something. Jax St only won by a TD over a pretty weak team, so we aren't the only ones who can be accused of winning close against the lesser teams. When it all shakes out we are going to be 4-5 IMO. Ugh- just saw that S D St won in OT. Anybody got any thoughts on how many the SO CON gets in? IMO, Western shot their chances today... Even if Furman loses, IMO they get in... If they win, then IMO its them and us. Samford only gets in with a win. Still guessing that Samford makes it with a loss. There are quite a few really weak auto berths and the strength is in the four big leagues. It would really be a shame if they got left out, but it sure is possible. How do you get to play a Pioneer League team in the first round? This afternoon there were 4-5 top 8 teams in trouble late and virtually every one figured out a way to win. Guess that is why they are where they are. Now it looks as if #7 or 8 is where we will be. Oh well, today's games show that every team can be beaten. A 7 seed wouldn't be too bad. Not a good day if you're rooting for 3/4 teams from the Socon to get in. Between Western losing, the CAA bubble teams won, a lot of big sky teams won, Austin Peay (who will be on the bubble with a win next week) won, Kennesaw/Monmouth won and there are going to be about 4 teams from the Southland with 8 or 9 wins with all of them winning or leading by two scores late. Looks like a 7-4 Socon team will not get in. Furman probably has the best chance at 7-4 to get in next to MVFC Northern Iowa, but I don't know. A 7 seed is not bad... I’d take my chances with a Quarter game in Jacksonville, AL... They could easily lose a second round game... They have not played well the last few weeks... Could give us a Quarter game in Gibbs if that would happen. SmallTownTerrier wrote: A 7 seed is not bad... I’d take my chances with a Quarter game in Jacksonville, AL... They could easily lose a second round game... They have not played well the last few weeks... Could give us a Quarter game in Gibbs if that would happen. By next Sunday, NDSU will have probably moved back to #2. In the end, you have to beat everybody to win the National Championship. Seeding just determines the order in which we beat them. Samford loses and they’re out... Only 6 D1 wins (one vs West AL)... Now think SO CON only gets 2... Too many 8 and 9 win teams. If Samford beats Furman, I think they both have a shot at making it. If Furman wins, they'll easily make the field and Samford will be on the outside looking in. Either way the only team that matters should be resting at home week 1 of the playoffs!